I have yet to have found a view that takes my breath away like this one. Photos cannot do it justice. 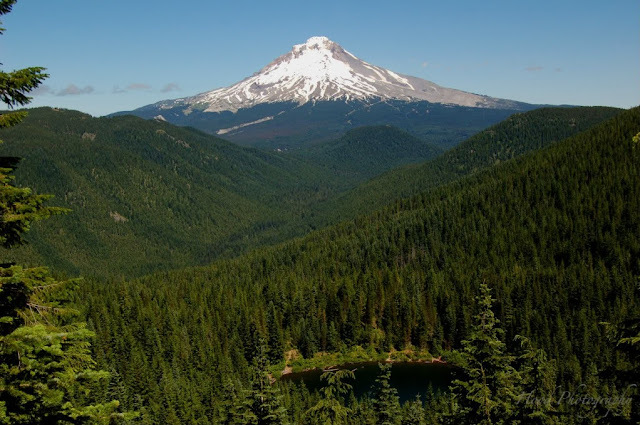 Looking up through the Still Creek valley towards Multipor Mountain (the "small" hill in the center of the valley) is an amazing view of Mt Hood, with Veda Lake resting in the forest below. To access this view, you drive up notoriously rough Sherar Burn Road 3.5 miles to abandoned Fir Tree Campground. From there you hike up the backside of Veda Butte about a mile (the first half being fairly steep) until you come to this ridge viewpoint. You can continue down the trail another mile or so to reach the lake and all its seclusion. what a beautiful shot - it IS breathtaking! WOW!!!!! Question: Did you have to hike up to this viewpoint or is there a road? majestic! what a stunning photo! I have only flown over Mt. Hood... That is a wonderful angle! Beautiful photo! I should really do some hiking... the best view is always on the hiking trail.